A superb instrument that leaves the competition in its trail. Gretsch exists almost as a window to a different era of guitars. You’d never look at a Gretsch and think it looks futuristic, but that’s not the point. A Gretsch guitar has always meant high grade and vintage-flavoured and they excel at this, but with great quality comes a matching price tag, putting a ‘real’ Gretsch out of reach for most. The Electromatic range solves this by offering the same iconic designs but producing the guitars in Korea. This Gretsch G5622T-CB Electromatic is one such example, cramming tonnes of interesting features into a package, which while still not cheap, is certainly more accessible. Our review model came in glossy black, with aged cream binding at its extremities and an imposing wall of shiny chrome hardware. Other finishes include the famous Vintage Orange, Georgia Green and Walnut. What makes the G5622T-CB particularly interesting is its hidden weapon: a chunky spruce centre block that greatly enhances its credentials at coping with higher volumes or gain styles without adding too much overall heft. A quick unplugged strum reveals this to be a wonderfully resonant guitar, as you’d expect. Hooked up to an Orange Rocker 15, provides access to a host of sounds from the two Super HiLo’Tron humbuckers. Big open chords at low-to mid-gain ring out superbly, while increasing the dirt provides some large, raw tones. The refreshed G5622T-CB also reverts back from the cat’s eye soundholes of its predecessor to a more classical set of f-holes, offering a slightly more refined aesthetic. The hardware is all weighty and oversized, giving the G5622T-CB a pleasing rigidity. Clearly a lot of wood and metal goes into the production of this guitar, yet it’s the small details that leave the biggest impressions. Like the way the tone and volume controls have a textured feel to the side of them, or the smoothness of the neck join; it’s well-engineered with bags of personality. In terms of competition, you’re looking at Ibanez’s Artstar line or Guild’s Starfires, which are fine instruments but can’t match the overall vibe offered here. 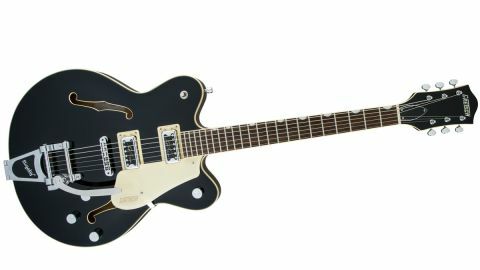 Gretsch is pitching the G5622T-CB as a guitar that can thrive among the rigours of higher-gain styles. The combination of the spruce centre block and versatile Super HiLo’Tron pickups certainly back that up. Of course, higher gain here is closer to Josh Homme than Lamb of God, but you could have a lot of fun with this guitar.